This is a 40 minute cruise along the Thames. The cruise starts and finishes at the Waterloo Millennium Pier (by the London Eye). The boat is accessible for people using wheelchairs. The wheelchair lift helps you get to the upper sundeck and the lower deck. There are accessible toilets on board. While you are on the boat you can hear about the history of London and the buildings. You will pass by St Paul's Cathedral, the Houses of Parliament, Tower of London, HMS Belfast, Shakespeare's Globe, Tate Modern and the Millennium Bridge. You also get a souvenir map. There is lots of seating under cover so it's okay to go in any weather! 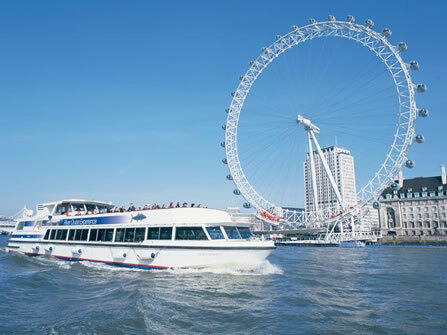 You can buy a ticket for the River Cruise and a flight on the London Eye if you phone 0870 990 8885. Click here to find out more about the London Eye. You need to get to Waterloo Millennium Pier 15 minutes before the boat leaves. The cruises runs every weekend and then every day between 19th March and 31st October. There are some changes in the times in Summer and Winter - it's a good idea to phone 0870 5000 600 to check the time your cruise is leaving. The River Cruise Experience can take 3 people using a wheelchair on each cruise. Phone 0870 5000 600 to book tickets. The booking line is open from 8.30 am and closes at 6.30 pm every day. You can also buy tickets at the London Eye ticket office in County Hall. Phone 0870 990 8885 to book tickets. Click here to book tickets online for the River Cruise and London Eye flight. If you are an adult it costs £10.00. - and you can bring a carer for free. - BUT it costs £10.00 at the weekend. All people with disabilities can bring a carer for free. Children under 5 can go for free. If you are an adult it costs £22.50. - BUT it costs £22.50 at the weekends, and in July and August. Waterloo Millennium Pier is near the London Eye is a landmark. There are 3 car parks on the South Bank about 5 minutes away from the London Eye. They all have accessible parking spaces. Car park 1: Hungerford Bridge. Car park 2: under the Hayward Gallery. Car park 3: under the Royal National Theatre. If you are coming by coach you can be dropped off at the London Eye - it is best to ring up and book a coach-parking bay before you go. The coach can park in the bay for 20 minutes - after that it has to park somewhere else while you go on the cruise. This is a free service. Call 0870 990 8885. 77 and RV1 are the nearest fully accessible buses. N76, 341 are the nearest fully accessible night buses. The N381 is not fully accessible. You can get to Waterloo Millennium Pier from Waterloo and Westminster underground stations. (Jubilee, Northern and Bakerloo line) - Waterloo underground station is about 490 metres from Waterloo Millennium Pier. From Waterloo mainline station, wheelchair users should go to the Waterloo International terminal, using the lifts to get to the ground floor. At Waterloo International follow the signs for the London Eye. (Jubilee, Circle and District line) - Westminster underground station is about 610 metres from Waterloo Millennium Pier. Westminster underground station is accessible for wheelchair users. Leave Westminster station using the exit for Westminster pier. Follow the signs to Westminster Bridge. There are signs for disabled access to Westminster Bridge also. Cross over Westminster Bridge and go straight past County Hall. There is a River taxi trip which travels between Westminster Millennium Pier and Greenwich Pier. It stops at Waterloo Millennium Pier. Call City Cruises on 020 7740 0400 to help plan your journey and find out about prices. There is a River taxi trip which travels between Embankment Pier and Greenwich Pier. It stops at Waterloo Millennium Pier. Call Catamaran Cruises on 020 7987 1185 to help plan your journey and find out about prices. Waterloo mainline station is about 480 metres from Waterloo Millennium Pier. The mainline station is accessible for wheelchair users. To find out more about access and facilities in Waterloo mainline station call National Rail Enquires on 08457 484 950. The way to the boat is accessible for people using a wheelchair using ramps - we will find out more and update this information. Both decks on the boat are accessible for people using wheelchairs - we will find out more and update this information. There is an accessible toilet and baby change on the boat. We will find out more and update this information. There are 2 accessible toilets in the London Eye ticket office. They do have hand rails and good colour contrast. They both have a baby-change. The doorway width is about 965 mm. If you speak French, German, Spanish, Dutch, Italian or Japanese you can hear about the history and buildings on a tape in your language.